Wow. Shoei has just created arguably the best sport-touring helmet on the planet as the Shoei RF1100 Helmet replaces the super popular RF1000. RevZilla can get behind this helmet for sure. Shoei brings 50 years of experience to the construction of this helmet, which they rolled out with the brand new Snell M2010 certification. The RF1100 boasts countless features that were native to the RF1000 but loads even more into an already top-of-class helmet. I'm not gonna go too deep in this post, but there are a couple upgrades I'd like to touch on. The rear spoiler is now streamlined into the actual helmet construction, rather than bolted on as was the RF1000's. The RF1100 comes in five shell sizes as opposed to three for its predecessor which means that as you go up in size, rather than simply making cheekpads bigger, the size of the entire helmet is changing. This means it's going to fit snugly and very comfortably. The exhaust vents are improved as well: the built-in spoiler now allows for a total of four top exhausts. In other words, this helmet flows serious air. It also has a taller and wider shield, the CW1, which features the QRSA (Quick Release Self-Adjusting) spring-loaded base plate system. Spring-loaded essentially ensures even contact with the window beading for complete wind and waterproofing. Man. I said I wasn't gonna talk too much about it. I lied. I guess that shows how obviously amped-up we are about this helmet. The RF1100 is game-changing. If you want more details, make sure you check out the video at the top of this post. 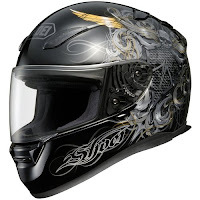 And if you want to browse through its competitors, check out our selection of Snell M2010 Certified Helmets.